Today we are all hopping to share the new My Monthly Hero kit for February! Keep reading to see the full kit, check out my projects made using the items in this kit, to see the details of the giveaway and for a full list of all the stops on the hop! The kit contents are worth $79.99 but costs only $34.99. You can subscribe to the My Monthly Hero Kit and ensure that it is mailed to you each month. Click HERE to subscribe. I have 3 cards using the new kit and a couple of the add-ons. 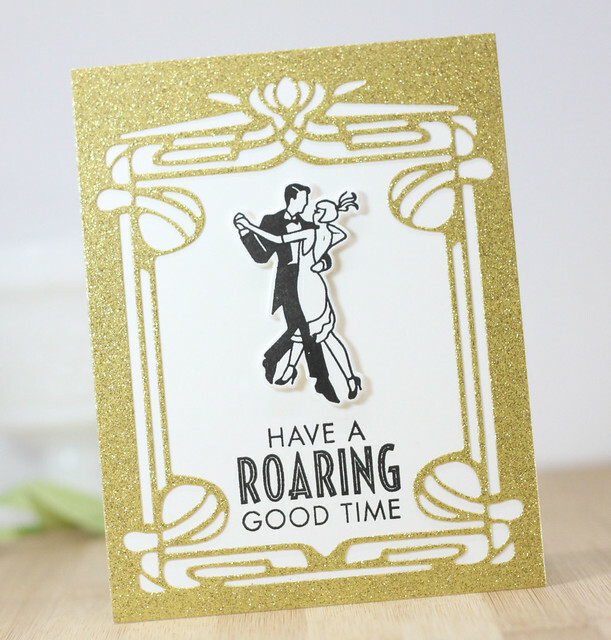 To create this card, I used the Vintage Window Fancy die in gold card stock to frame the card base. I added in the image of the dancing couple after it was die cut. I used fun foam to give the image some dimension. Last, I stamped the sentiment along the bottom of the window. The sentiment is full of sentiments perfect for the party card! This next card showcases the new Dancing Music Notes Confetti Die. I used the die to emboss the card instead of cut. I ran the music die through again with gold cardstock and with black. I added in random notes to the front of the card and then stamped the sentiment from the main kit to complete this clean and simple card. I used that gorgeous stencil in the background and blended in some Gold Delicata Ink. I love the shimmery look it adds to the card. Next, I used some of the deco designs to decorate the card front. I stamped the frame along the top and bottom of the card and then added in the sentiment along the bottom. I grabbed the little burst image and added that to the top of the card. I stamped and die cut the dancers and popped them up on foam tape. The kit includes some gold and black confetti and I added in several pieces to the card front to finish it off. There will be lots more to see on this hop. 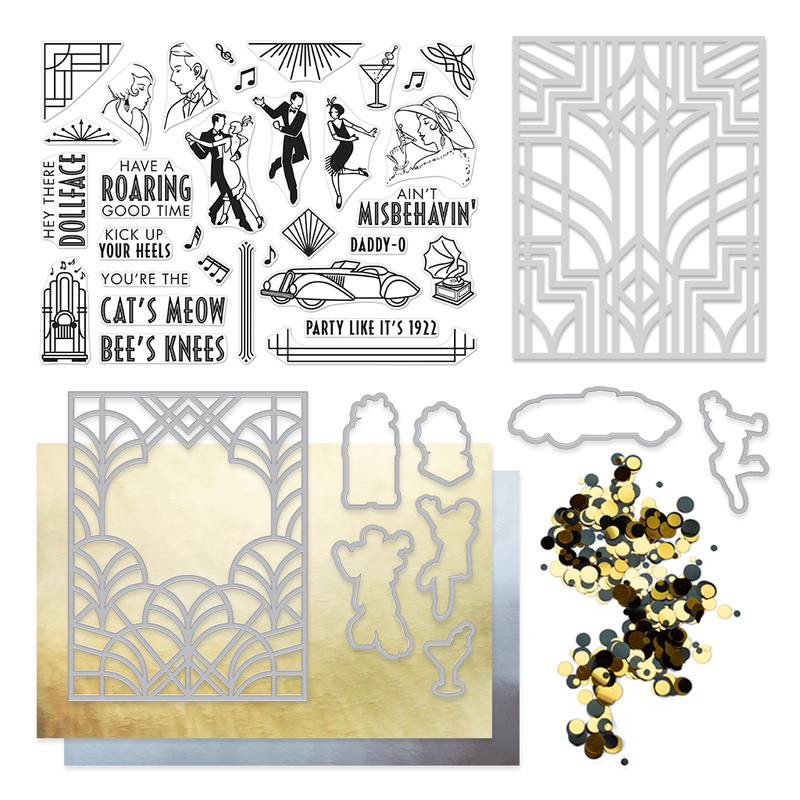 This kit has an awesome Art Deco feel and makes for some really pretty and interesting cards! Hero Arts is giving away one kit as a prize to one blog reader - selected from the comments across all of the blogs in the hop. The giveaway closes Sunday, February 10th at 11:59pm, and the winner will be announced the following week on the Hero Arts blog. I hope you have enjoyed my stop on the Hero Hop today. I'm so glad you stopped in! Have a great day! The gold glitter frame really highlights the central image on your first card. But I really like the "kick up your heels" sentiment....it can be used for so many different reasons. And the way that you used the die was very unique. I like all of the glitz and glam, these are marvelous! These are so classy and fun! What a great kit! Love that Dancing Music Notes die, too!! Love all your cards. Can't wait to give this kit a try! 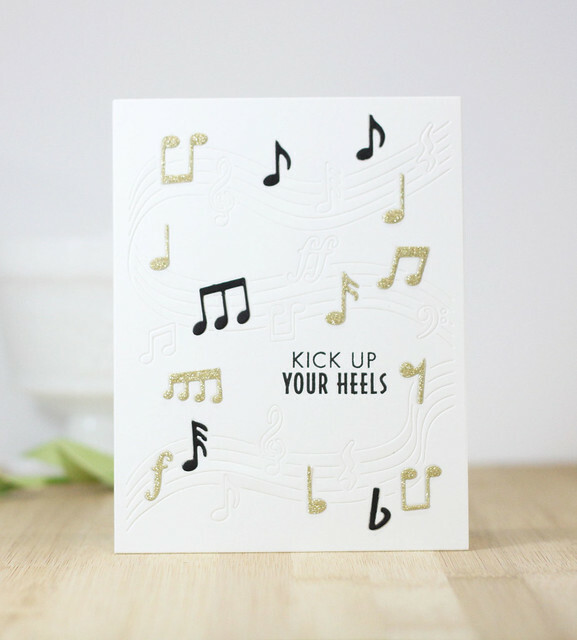 You will have us all dancing with these great cards! TFS! CAS and just plain cute! A winning combination! I especially like the Party Like it's 1922 card. It looks wonderful! Your cards make me want to get up and dance! Party like it's 1922 is my favorite card. The background is nice and subtle and the images really stand out. Love the elegant cards made with this kit. Love the options for frames and borders. Beautiful cards... love your black and white and gold theme!! What a fun kit! Laurie, I am posting a comment again because the one I "Published" 2 hours ago didn't come through. I love this Release Kit more than any other I've seen. I also love the three cards you created. I'd just have to purchase the Dancing Musical Notes as well. That card is so much fun. Just makes me want to jump right in & join them! Thanks. What a fun kit and wonderful cards! Love the embossi g with the music die, beautiful card. Super pretty cards!! LOVE this kit! That frame is gorgeous and I love how you used different colors on the music background. Great work showcasing the release! I love that window die! What a great idea to emboss the music die instead of die cutting it. It's makes for an interesting background. beautiful cards and great hop!!! Beautiful cards! Love all the gold! Love the use of gold glitter cardstock. Nice job. Thank you for the opportunity. I like the soft colors and how you put the cards together. Makes them look like in a ballroom. I love the pure sophistication of this kit & your cards. That first one has just the right amount of gold glitter to look stunning. I can see why this era was so loved. Thank you for sharing your inspiration. Great card samples with this fantastic collection! All three of your cards are awesome! But I especially like the last card, the black stamping, seems to float above the stencilled background. Great job! What a great blog hop, love it and the kit, ordered mine. 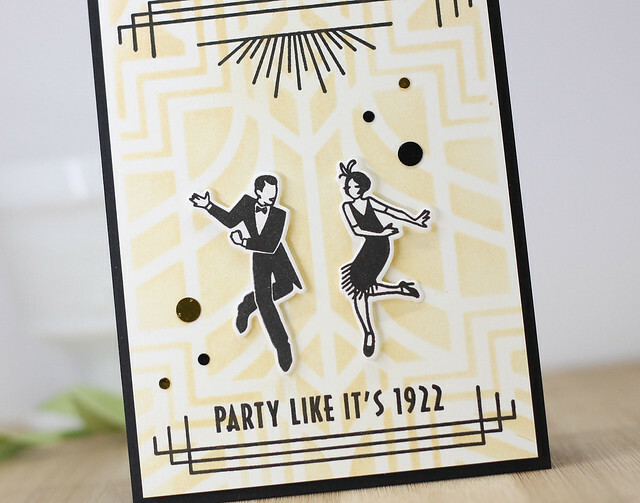 Love these cards and all things the "Deco era". Would love to win such a great prize. Hugs. love all the gold glitter on your cards, Laurie - great new HA collection! This is a great kit and I love the cards you have made with it. Your cards made me like a lot of the elements I didn't think I cared for in the kit, thank you. And thanks for sharing. I need this kit! I've had so much fun seeing these wonderful nostalgic cards. Reminds me of my parents. This is a fantastic release. You have created such beautiful cards. This kit is great! Beautiful cards - especially that gold die cut deco frame. I love the gorgeous lines of that, and it frames the couple so beautifully. 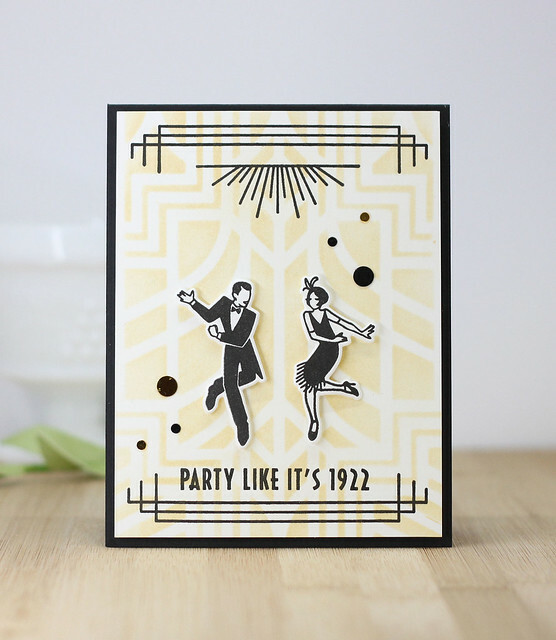 What fun art deco cards and a marvelous kit! Really like the card with the dancers! Beautiful and classic! Thanks for using the add on with the musical notes. I wanted to see what that one looks like and the card using it is delightful! Simply elegant cards. Love this HA kit! TFS! Beautiful cards and a great kit. Awesome new Kit, I love the Art Deco style! Gorgeous creations! I especially love the glittery gold framed dancers card ! These are lovely. I really like all the gold shine. Your layouts are wonderful. Thanks for the inspiration. Hi Laurie. Your cards are simple but so elegant! I like the clean lines and I especially love your use of the music notes frame cut die. Thanks so much for using it and giving us some much needed inspiration. Best to you and your little ones. Love the art deco theme....very different! I love your beautiful cards! 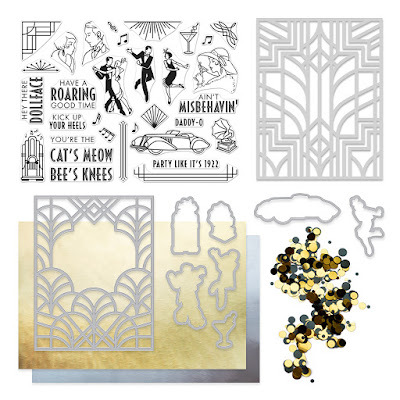 This is such an awesome kit and I don't think you could go wrong with any of the images or dies! Thanks for the inspiration! Your cards are fabulous. Love the sparkly gold framing on the first one. Thanks for sharing your awesome cards. This kit is terrific. Such fun cards! I am loving the versatility of this kit. Thanks for sharing. You've showcased the Art Deco in this kit beautifully, Laurie! Love all of your cards! 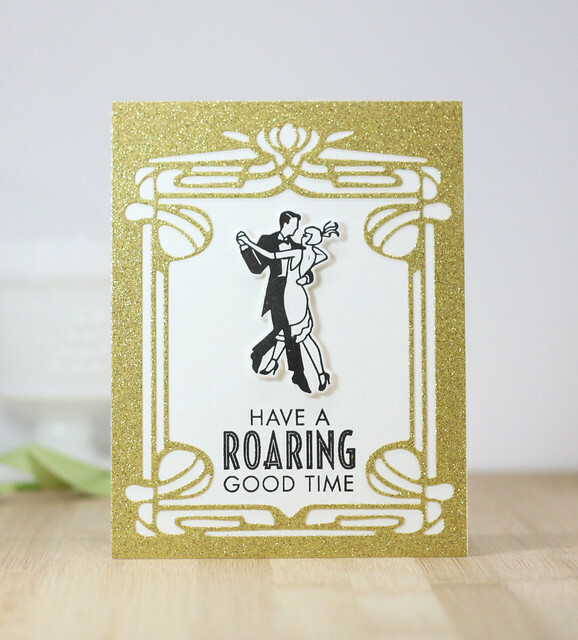 Gorgeous, elegant and fun cards! Fabulous designs and inspiration. Gorgeous cards, Laurie! You have done a wonderful job of showcasing this great new set! Thanks so much for sharing your great inspiration! GREAT kit and love your cards! So many possibilities and you have showcased such great inspiration! Thanks for sharing! Fantastic cards! I love the way you've used the kit! So elegant. I love your CAS style!